We get asked this question a lot these days and my guess is that most people think of risk as volatility. I disagree. I, along with other Trimark portfolio managers, look at risk as the potential for permanent loss of capital – losing money. Overvaluation. During the tech boom, for example, people were buying Cisco* at 100 times earnings. Sure, it’s a great company, but when you buy a company at that kind of multiple, you’re never going to get your money back. Balance sheet problems. If you invest in a highly leveraged (too much debt) company that is forced to raise equity or is pushed into bankruptcy because of balance sheet issues, that’s permanent loss of capital. You’ll never get your money back in those situations. Fundamental change. What do I mean by this? Newspapers and the Yellow Pages* are two great examples. These were great businesses for a long time, but the rise of the Internet changed everything and has forced many of these businesses to change or get left behind. So investors who bought into them 5 or 10 years ago just aren’t going to get their money back. When our team is making investments, these are the pillars we focus on when we think about risk. We try to avoid buying overvalued companies, we obsess over balance sheets and we gauge the sustainability of a business, the industry and the long-term growth pattern. But…if you still want to use volatility as a measure of risk, take a quick look at this chart. We may not focus on volatility, but by buying the sorts of companies we believe represent less risk, our small-cap funds subsequently have much lower risk metrics – lower standard deviation, better Sharpe ratios*** and lower volatility of the fund as compared to our peers. **The down capture ratio measures how well or poorly an investment manager performed relative to an index during periods when that index has dropped. The lower the down capture ratio, the better. ***Sharpe Ratio measures your excess return on an investment for the amount of risk taken. The higher the Sharpe Ratio, the better. 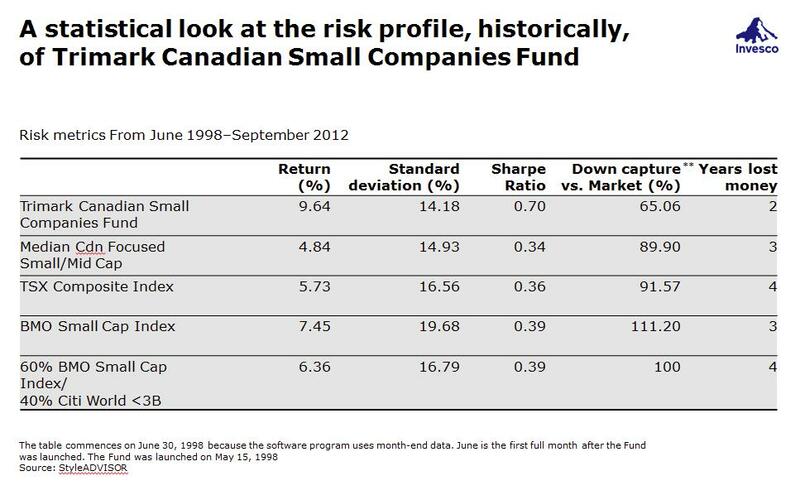 Trimark Canadian Small Companies Fund, Series A provided the following performance returns as at September 30, 2012: 1-year, 15.42%; 3-year, 11.55%; 5-year, 2.64%; 10-year, 8.18%. The risk of permanent loss of capital rarely justifies the potential capital gain within the managed money business. when you get caught in a quick decline of valuation. Thanks again for reading and sharing your thoughts on risk. Good blog, but I also try to remember that what I consider to be risk may not be the same as my client’s definition. The increased volatitily over the past few years has made many clients increasingly gunshy about any volatility/temporary drop in the market. Tammy, you make a very astute point about opportunity risk. In thinking about my answer to both your questions, I realized they make great topics for a short blog post. Please stay tuned for an answer to your question on the blog. I will be sharing some of these ideas with my clients. Really enjoying reading these blogs. I our clients always look at risk as volatility because they cannot differentiate between short term volatility and permanent loss of capital which I feel has been blurred by 2008. In this market I personally believe that a missed opportunity is a higher risk. My members are are of the opinion of the blogger though; they don’t want to see a loss. Is there the best of both worlds? High Yield are in fashion currently but do you think they will run their course too quickly and leave us trying to do damage control? You’re right. It’s exceedingly rare to have a company trade at that kind of multiple and be a successful investment. I have, and currently do, hold companies with very high multiples, but these would be cyclical companies (i.e. natural gas, energy services) or companies with temporary problems that have depressed earnings in the near-term. While the multiple on this year’s or next year’s earnings might appear high, I have a thesis on why earnings will be much higher in the future (new product launch, cyclical recovery, rebound in commodity prices etc.). However, absent these situations I’ve never held a company with the kind of multiple you cite.There are, however, an extremely small number of examples in history of successful investments of this type. For example Microsoft traded at over 70x earnings in the late 1980s and well over 30x for most of the 1990s. From March 14, 1986 through December 31, 1999 Microsoft went up 58000%, a staggering 59% per year on average. Of course, since then the stock is down 48% (from January 1, 2000 to November 12, 2012, Source: Bloomberg), so eventually it ended. There have been other great growth stories, Texas Instruments in the 1960s & 1970s and Home Depot in the 1980s & 1990s, when the performance of the business easily justified huge multiples. However, there are far more examples of companies that many thought were the next Microsoft, and had the corresponding multiple, that later proved otherwise and had substantial declines. So while there may be a company at 70x+ earnings that works, I’m not sure the risk of permanent loss of capital justifies the potential gain. Hi Brendan, It’s nice to hear you are a fan of Invesco Intactive, as Trimark funds are an important ingredient of that line-up. Because I am focused on managing my specific fund mandates, I think your question would be best answered by a member of our Global Investment Strategies team. I’ve passed your question along and the appropriate person will be in touch. Thanks again for your question. Great perspective, I am sure when we ask our clients to define risk the answer is almost 100% of the time going to be “losing my money”. I still define risk as volatility. That’s how most clients also think of it, once you question them about what worries them about investing. Thanks for all the comments on this post. The way we view risk is a key element of our investment discipline. Thanks for reading. When it comes to overvaluation. Can you cite examples of companies that lived up to the hype — has there really ever been a 70-100x earnings Co. that you have held with confidence? I personally have a hard time finding an example. My target market should & does onlyn have what I refer to as “managed money”. Thanks for continuing to allow me to not have to be concerned about the your fundamental approach to asset management. This allows me to focus more on the ‘value-added’ principles of my proposition to/for my client base. I define risk based on what my client wishes to see return wise in the long term and to what level of volatility that they would likely need to achieve their long term goals. Funds generating 9% are great. However if a clients goals only require 4% annualised, then they can have a smoother ride. I am a firm believer in diversification and rebalancing. It always seems to be a tough conversation to sell the high and buy the low. In our firm we use portfolio funds. We rely on the fund company and professionals educated in investment management to make informed decisions. Speaking of risk – last year I was introducted to the Intactive funds. I really like the objectivity and oversight that the GAA provides. In Trimark’s opinion how does this engineered portfolio compare to portfolio funds developed by other fund companies? I see the site needs a spell check for people like me. This is off topic but I wonder if our industry is going through a fundemental change or just volatility. I agree with this comment and a lot of clients feel risk even when good fundamental companies go down in value due to recession or other emotional events such as macro. We need to clients focus the real risk such as this blog not media or macro events that effect good fundamental companies. This is very useful information. Thank you!